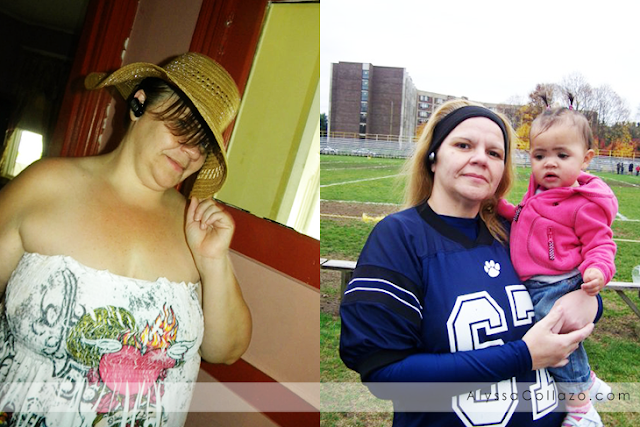 While growing up, I watched my mom struggle with Weight issues and Diabetes. I also remember the day she decided it was time for a change. She wanted to take not just her health but ours more seriously. She decided to clean out the kitchen. She got rid of all the junk and started to make a positive change in our poor eating habits. When someone is struggling like the way my mom was, they need support and lots of it. I was my moms cheerleader. I would attend meetings with her and do my best to push away from those bad cravings and into healthier choices. But after years of struggling her doctor took the plunge and recommended Gastric Bypass Surgery. He explained that it would take the weight off but it would also help with her diabetes. After my mom had her surgery she was determined. She was working out and eating much better. But let's remember, she's human and we are flawed. She, like anyone else had cravings for the not so healthy foods. We wanted to find something that my mom could totally mask joy in but not spike her glucose levels. That is when my mom was introduced to Glucerna. 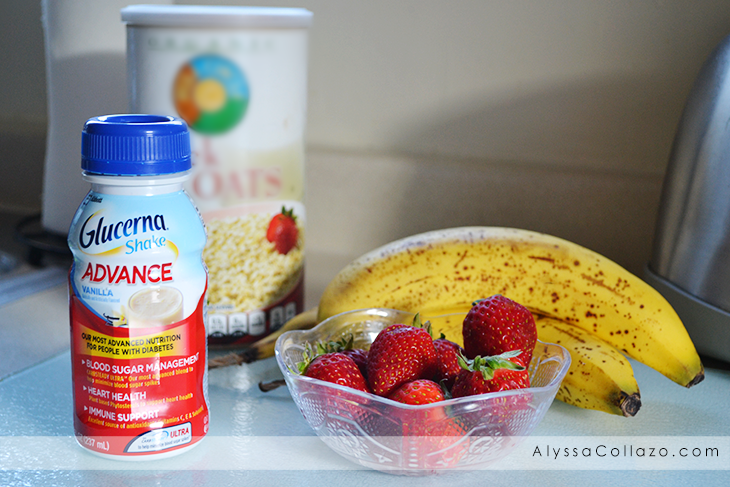 Glucerna is a meal replacement plan that has a variety of shakes and bars. For awhile Glucerna was doing fine but you know when you have Rice and Beans every Friday of every single week and breaded chicken every Thursday of every single week, and pizza every Saturday of every single week, you get bored..... Well, so did my mom. Can you blame her? 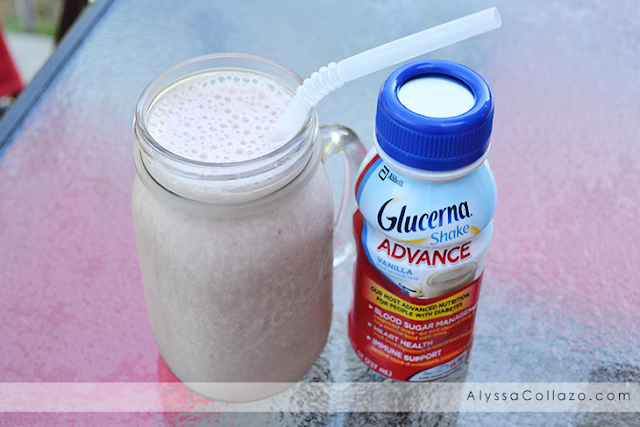 Yes, Glucerna has a variety of flavor choices but it wasn't enough. It's like having Rice and Beans or Yellow Rice every Friday but made Differently. Boring! Where's the mix up? What about the Empanadas, Alcapurria, Pasteles? This is where my post comes from. 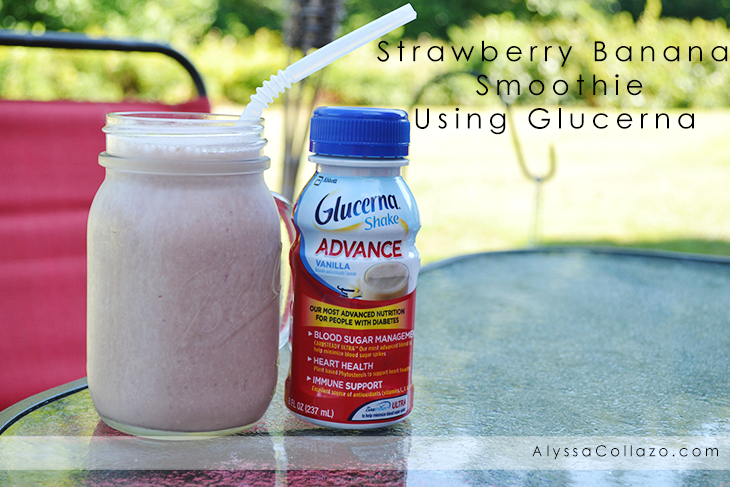 Trying to help my mom mix things up, we started using Glucerna in smoothies. She still gets the benefits of Glucerna plus the benefits of fresh fruits and veggies but in a whole new light. Some of her smoothies would look amazing and well, others not so much! Ha. Her favorite was Strawberry Banana and I can't blame her there. I wanted to share this recipe with all of you because it's important to remember that despite the fact that we may get stuck eating or drinking the same thing, there is always a way to change it up and still remain healthy and beneficial. 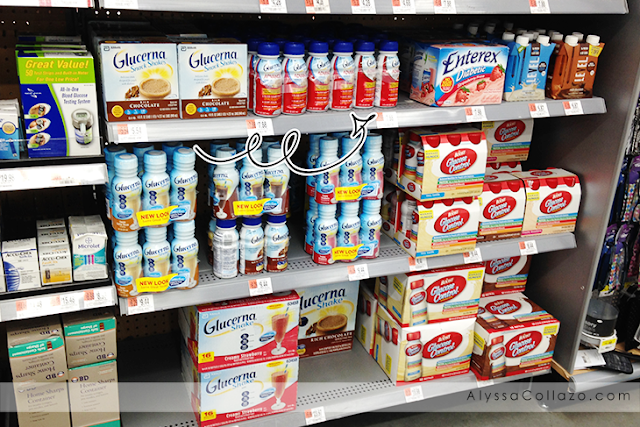 You can find Glucerna at your local Walmart. 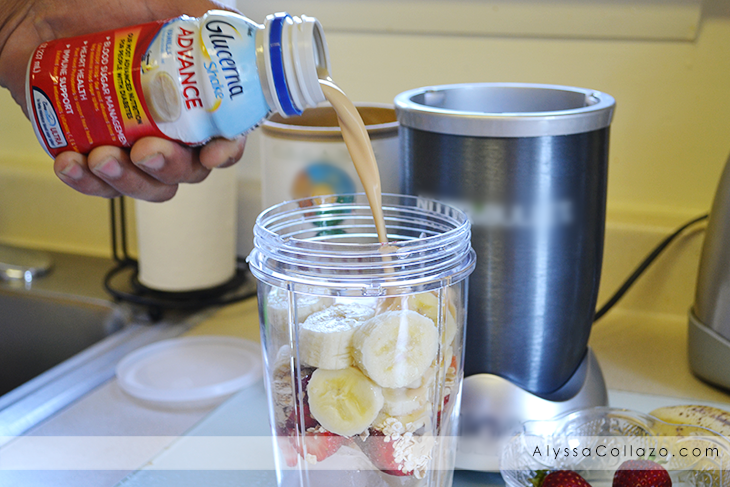 In a blender, add Ice, Strawberries, Quick Oats and Bananas. Place the top on blender and blend away. And just like that you have a delicious Smoothie packed with amazing benefits and thanks to the Glucerna this Smoothie also has CARBSTEADY ULTRA, which includes slowly digestible carbohydrates along with Vitamins including C, E & Selenium. This Smoothie is more than a Smoothie, it's part of a Meal Plan and will surely satisfy your hunger and help minimize Blood Sugar Spikes. Are you ready to try Glucerna? Here is a Coupon for a $1 off of any one (1) Glucerna product. Also, be sure to check out Glucerna Steady Ahead Video. If you would like more information about the amazing array of Shakes and Nutritional Bars from Glucerna Click HERE to learn more. My mom is a diabetic and doesn't eat right all the time. I think I might surprise her with a smoothie the next time she is over my house! That looks delicious I don't know anyone who is diabetic myself, but I know it can be hard to be diabetic and still stay on target! That sounds like a great smoothie. I know they're marketed to diabetics, but I would think that if they're good for diabetics, they're probably great for people without blood sugar issues as well. Even non-diabetics shouldn't be spiking their insulin. This sounds really helpful to anyone looking to get on a healthier path. The flavors sound like they are good too. I'll have to pick this up and see if my dad will try it. He has gotten in the habit of eating a very limited diet out of habit so I know his nutritional needs aren't being fulfilled. My dad is diabetic, but he is very disciplined. He exercises and takes his meds regularly. He loves to eat, so we allow him to binge from time to time. He would compensate it with more exercises if he ate a lot. What a great idea to add fruit to these drinks. I wouldn't have thought that people would enhance these types of drinks. We use Glucerna at the hospital I work at. I think it's a really great product!! Yum, this sounds delicious! I've never had Glucerna before but strawberry banana is my favorite smoothie so I bet it's amazing! Awesome smoothie recipe! So wanted to try this soon! I've hear great reviews about this. I'm glad that there are products like this one that's specially formulated for people with diabetes. I love fruity milkshakes, I usually use almond milk with my banana and stawberry. I have never tried this drink before. I don't personally know anyone st this point who is diabetic. I'm hoping I don't get it. That looks so yummy. I have never tried Glucerna before but I am so curious now. Would love to make fruit shakes with it too! I love to make smoothies, especially for breakfast. I do have to watch the ingredients that I use...so Glucerna is something that I could use and not have to worry! Awesome recipe!! we love smoothies at our house. we eat them a lot for breakfast. YUM. My husband is diabetic. I have seen these at Walmart and never thought of picking any up for him to try. I will have to get some now. One reason to get a Glucerna. Me and wife would love to try this. I find a lot of benefits from it. My father is pre-diabetic so he's been making changes to his lifestyle so keep it from go any further. He's been great at the changes. I'll have to tell both of my parents about this since they both struggle with diabetes. Sadly, diabetes runs rampantly on both sides of my family. I have lots of family members that would benefit from this product! Thanks for sharing! Oh this could be a fun thing to add to my morning shakes! I love that it adds something different to our health and is better than what can be reached for breakfast. My parents are diabetic and I think Glucerna will help them. I'll look for this at the grocery.